Bournemouth Borough Council: Pure Town Planning is pleased to announce a recent retrospective appeal win in Bournemouth for the erection of an outbuilding along with partial building works to remove the pitched roof so that the building would have a flat roof. The appellant came to us after Bournemouth Borough Council refused the retrospective planning application. The Council considered the storage building to be excessive in footprint and size, of poor design, out of character and be a dominant structure that would be visible from Hillcrest Road. Once instructed, the appeal statement was written to demonstrate that the building is only partial visible from certain public vantage points and that with the pitched roof to be removed and the building to become a flat roof, it was put forward that there was no material harm to character and appearance of the surrounding if this building were to remain. Ultimately, the Inspector agreed with our justification noting: “I could not find a location in Wimborne Road from where I could see the existing building. The front of the building is set well back from Hillcrest Road with the 2 adjoining buildings tightly enclosing the driveway that leads to it. Consequently the only public viewpoint I could find of the building is directly in front of the entrance. 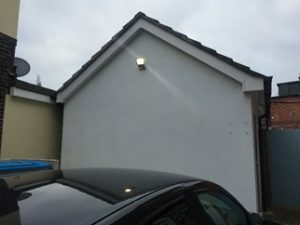 That limited view is of the narrow front elevation which has the appearance similar to a residential garage which would not look out of place within Hillcrest Road where there are a variety of building styles”. The Inspector duly allowed the appeal and granted consent much to the delight of the applicant. If you have recently had a refusal and would like a clear and honest appraisal of your chances at appeal then why not get into contact with Pure Town Planning on 01202 585524 for a free 30 minute appraisal.